Yesterday I went to the OB for a doctor's appointment. It was supposed to be the standard check up now that the bleeding has stopped. However, when I got there they couldn't find the heartbeat with the doppler. My heart dropped into my stomach. The nurse told me they would do an ultrasound to find it. So she brought me into the ultrasound room and told me to undress. I thought I might throw up. And then I waited. And waited. And waited. And then I had to go to the bathroom, so I quickly got dressed and went to the bathroom. Then I undressed and waited some more. My shirt was starting to get damp from sweating because I was so nervous. It was kind of gross. I was starting to stick to the paper. Finally, after 45 minutes of waiting half naked and sweaty, the doctor came in. Then, he couldn't get the ultrasound machine to work, because it was a new one and he didn't know how to use it. Eventually he ended up doing the on the tummy ultrasound and we saw our little munchkin doing flips and flops--which is probably why the nurse couldn't catch it with the doppler. 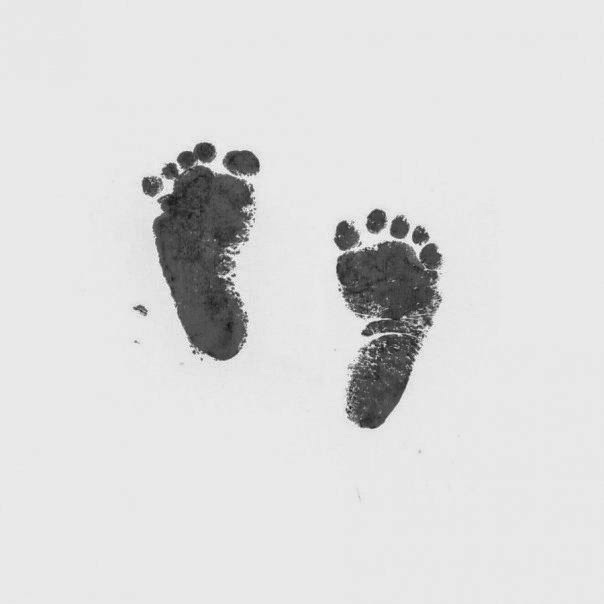 The baby was so active that the doctor couldn't even get the heartrate. I'm guessing that doesn't bode well for me when it comes out of the womb...Anyway, I'm glad that I got highlights in my hair last weekend, because otherwise I'm pretty sure my hair would be streaked with grey from my stressful appointment. I think when things like that happen, that patiend should be pushed to the beginning of the line, so they don't sit there worrying for 45 minutes! Good grief. On a completely different note, I wanted to show you what you have been missing if you haven't seen what fashion week had for spring style. Liam picked out his clothes--including shoes and socks and refused to wear pants all day. But at least he took a three hour nap dressed like that! 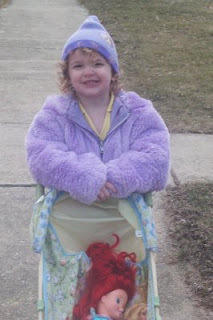 And isn't Rori just rocking her new lavendar fur coat?! What an awful doctor's apointment - I'm sorry! I'm so glad everything was fine though! LOVE the new coat on Rori - SO Cute. And Liam looks very comfortable. What is it about kids and no pants? 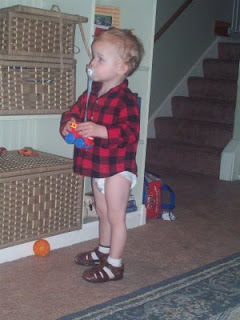 My kids think going pantless is HILARIOUS, and Christian prefers it most of the time if I let him! Ok, girl...talk about baby stress!!! I'm so glad to hear that Baby Patrick is doing well and keeping busy! I don't know....either you're in BIG trouble when he comes out or you'll have a very calm and happy baby -- can't wait to find out. :) I think it's time to have a chat with that Dr. or whomever is doing the scheduling. They need some kind of efficiency/time management/dr. office review board of some kind!!! Golly! Do they not understand the stress you were under or your bladder? Ok...enough blabbing -- sorry! Yes, Liam is stylin'! Rori is too cute in her coat -- is she going to give it up for summer? Love both pics! Liam gets his fashion from uncle Ryan- I thought diet coke was going to come out of his nose! Will ladybug get to wear the fur coat too?